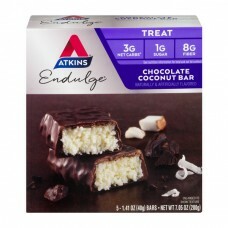 Atkins® Endulge® Treat Chocolate Coconut Bar. 3g Net carbs*. 1g Sugar. 8g Fiber. Naturally & artificially flavored. 5 - 1.41 oz (40 g) Bars. Net Wt 7.05 oz (200 g). Atkins® has all your weight loss needs covered with products for every occasion! Meal†: Packed with protein and fiber to keep you satisfied. Snack: The perfect amount of protein and fiber for a between meal snack. Treat: Indulgent dessert without all the added sugar for a perfect after meal treat. What is the "Hidden Sugar Effect?". It's common knowledge that consuming foods that contain large amounts of sugar may cause your blood sugar to spike. But did you know other types of carbohydrates may have the same effect on blood sugar? At Akins®, we call this the "Hidden Sugar Effect." For example - vanilla cake with frosting has the same impact on blood sugar as 8 teaspoons of sugar. * An Atkins® Endulge® Caramel Nut Chew Bar has the same impact as 1.5 teaspoons of sugar. * *Based on glycemic load. Amounts do not represent sugar content. Find out more about the "Hidden Sugar Effect" at our website. *Sugar alcohol total includes 3g of glycerin. *Counting net Carbs? Fiber and sugar alcohols should be subtracted from the total carbs since it minimally impacts blood sugar. Total carbs (19g) - Fiber (8g) - Sugar alcohols (8g) = 3g Atkins net carbs. FSC, Mix Board from responsible sources. Paperboard packaging recyclable®. 1-800-6-ATKINS. www.atkins.com. © 2017 Atkins Nutritionals, Inc.